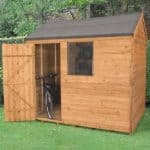 The 10′ x 6′ Traditional Standard Apex Shed will offer you more than enough room to make sure you have a great place to get some work done on your DIY projects, keep all of your tools and gardening supplies organised and even have a space the kids can store their toys rather than leave them on the garden lawn. This is a very spacious shed which offers lots of floor space and plenty of headroom to make this a place you will enjoy spending time in. The design of the structure has been done so that it really can fit in and not look out of place in any kind of garden. 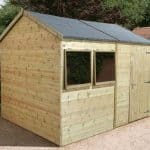 To back up the good looks of the shed are some very high end materials which have been selected because of their high quality and the way they will last for many years. Solid, 12 mm thick tongue and groove shiplap cladding is used for the walls. Even the flooring and roof is made with tongue and groove cladding. The materials really are going to make sure that no water is going to find its way inside of here. This is a very large sized shed that is going to be with you for a very long time. 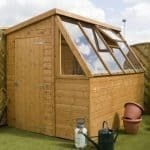 Offering plenty of storage space and a very nice look the 10′ x 6′ Traditional Standard Apex Shed is here to solve all of your storage problems. This has that classic shed look which makes this a building which we feel would not look out of place in any style of garden. Anytime you see a 10 in the name of a shed you know it is offering some impressive room for storage. At 10 feet deep and 6 feet wide, once you have built the shed all that empty space staring at you really does look huge and we are sure you are going to really enjoy making use of it. The height of the shed is more than enough as along the ridge we have 7 feet 1 inch of height and even the lowest point of the shed, the eaves is a not too bad, 5 feet 6 inches. The apex roof is what allows for so much room inside the shed and we were very impressed when we saw that the boards were 12 mm tongue and groove boards. These are very strong and more high quality than what most other sheds offer when it comes to roofing boards. To protect the boards and of course everything else inside the shed there is some good quality felt. Once you have installed the shed, run your hand along the cladding and you will notice right away that there really is no little nooks or crannies that water is going to be able to get inside. Made with some incredibly high quality redwood and at 12 mm thick this tongue and groove shiplap cladding offers both style and protection. A 44 mm x 27 mm frame is what is used to keep the shed together and to say we were impressed with this frame is a huge understatement. The amount of effort put into the design of this frame is just incredible the edges have been rounded to make them that little bit better as well as looking more appealing. We have no doubts at all that this frame will be just as strong 10-20 years from the day it is built. One other interesting thing about this frame is that if you ask there is the option to make the frame even more durable by getting a heavy duty frame inside the shed. The cladding, roof and the frame are very high quality and we are sure you have assumed by now that so is the roof. Well your assumption would be right as the floor is made with the same 12 mm tongue and groove boarding as the roof. This allows for a lot of weight to be placed on top of it. It is pretty safe to say that no matter what you are intending to use this shed for that the floor is going to be able to handle the weight with ease. The shed will be given a free coat of treatment before it is delivered to you which we think is fantastic as it means your shed is starting its life off right. But it will be down to you to keep up with the annual treatment to keep the shed looking great and staying strong. To be fair this shed does not require all that much work to keep it in good shape. You will be given a one year warranty that will protect you against things like rot and the off chance that there will be some kind of issue with any of the materials. The door that comes with the shed is a very respectable, 5 feet 9 inches high and then 2 feet 6 inches wide. We feel this is a very generous sized door, but if that is not enough for you then you can actually have a double door put on here which will make the width 4 feet and cost an additional, £53.99. Also if you want to give the shed a bit of a different personality then you can change the regular door for a barn style door. The door will be kept in place thanks to some very high quality silver looking hinges. We always love to see a set of good hinges on a door and we are more than happy with what is being used here. The 10′ x 6′ Traditional Standard Apex Shed has three windows which can be placed on either side of the shed during construction. Each of the windows is made from very high quality, horticultural glass which looks way better than some kind of plastic material which many sheds are using these days. These are all fixed windows, but for £31.99 you can actually have it so one of the windows can be opened and closed. The security of this shed really did impress us as there is no need to go out and buy a padlock or a pad bolt. You could if you wanted to, but as this shed actually has a lock and key it is not really necessary at all. The whole shed has a very robust feel to it so we do not see anyone forcing their way inside. While the windows are a great addition to the shed they do make it very easy to see what is inside. To keep things a bit more private you have a couple of options. First of all you can buy some curtains or blinds to cover them up. Or when you order, you can actually request that there are no windows included on the walls. 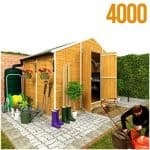 We know that some people will want to make the shed fit in with the other things they have in their garden. Well the best way we think to do this would be to paint your shed with some coloured wood treatment. This way you can make sure the colour of the shed goes with the rest of your garden. Or you may even want to pick a colour that will make your shed stand out from everything else you have. As far as extras go, we touched on the windows and the door up above, but there is also a set of wooden floor bearers which cost, £40.99. This would be something to consider if you are not too sure on the surface you will be installing the shed. We were very pleased with how high quality everything about this shed. While the extras available are very interesting and tempting, really the shed is top quality as it is. With a yearly coating of treatment and a little bit of looking after, this shed is going to be with you for the long haul, we are certain of that. At 10 feet deep and 6 feet wide, you have plenty of room to use inside here. We find this amount of storage space lets you organise the shed the way you want which is always a good thing. All you need is a friend and a flask of coffee and you will have this up in a few hours. While this is a large shed, we do not think it will pose to much of a problem when it comes to building it. 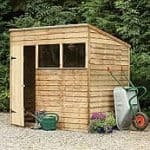 The size of this shed and the price they are asking is more than fair. Especially when you consider how reliable and long lasting the materials they have used for construction are. 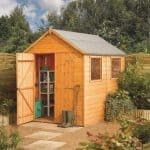 Final Thoughts: The 10' x 6' Traditional Standard Apex Shed really does offer and do exactly what you want a shed to do. What we really love about this shed is just how it would be ideal for people from all walks of life. A person who likes to have a quiet space to do some DIY and keep their tools safe will love this, but at the same time a family looking for a large amount of room to keep kids toys tidied away are going to really appreciate this. 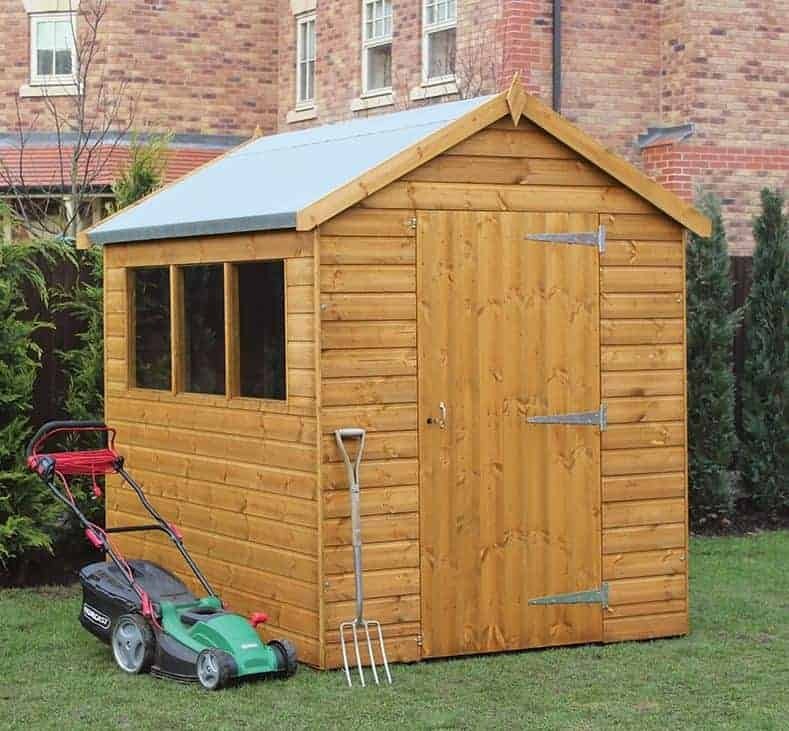 While the price may be over £500, we still think this shed is one excellent deal.